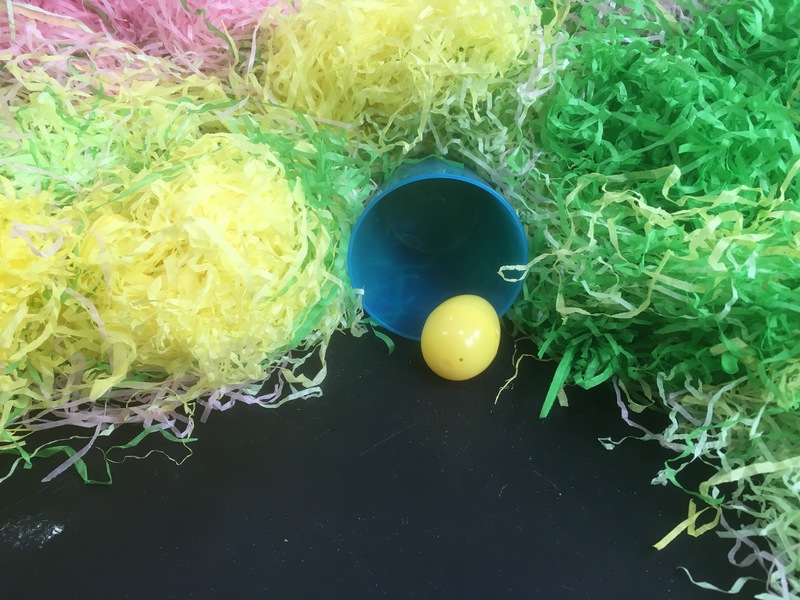 In our sensory tray we have had Easter grass with plastic eggs and chicks. Bobcat has especially enjoyed opening the eggs to find the chicks inside. 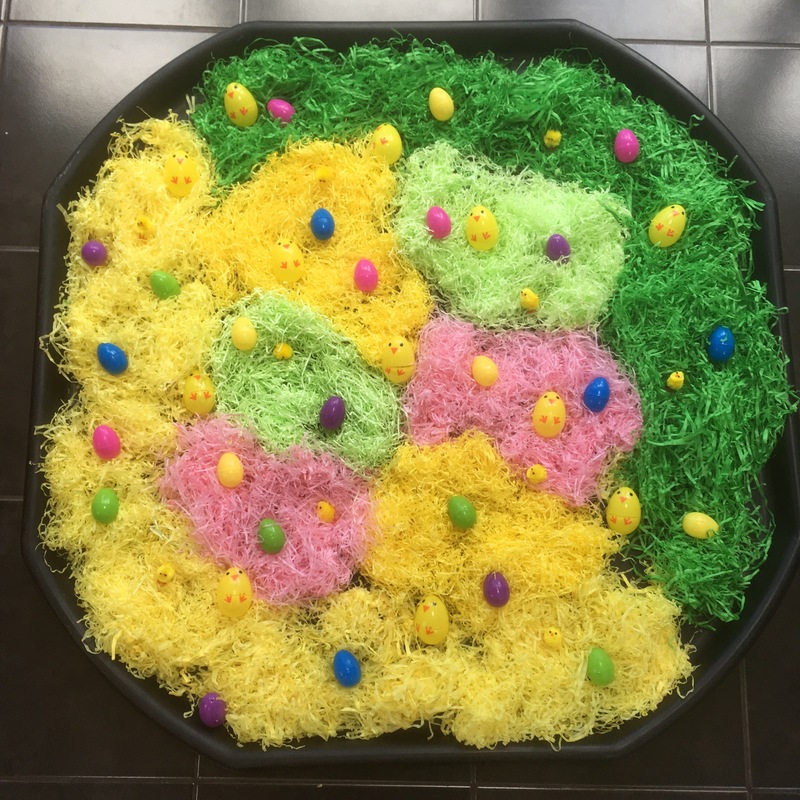 When Grandma came she told us about the egg rolling they do at the school she works at, and we created a hole in our Easter grass hill to roll the eggs into. 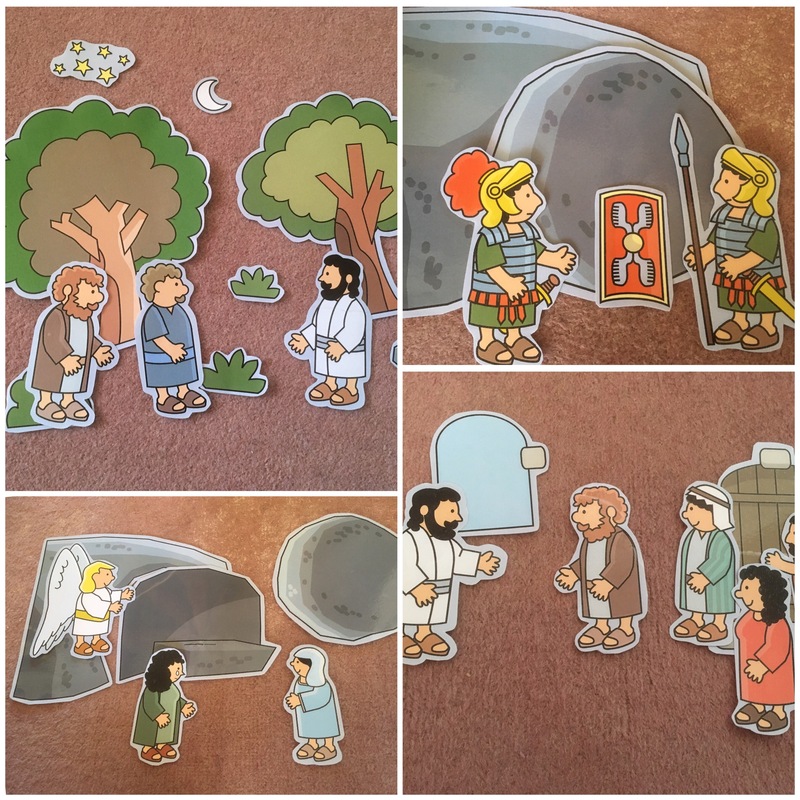 We used the downloads from 1+1+1=1 to recreate the Easter story. 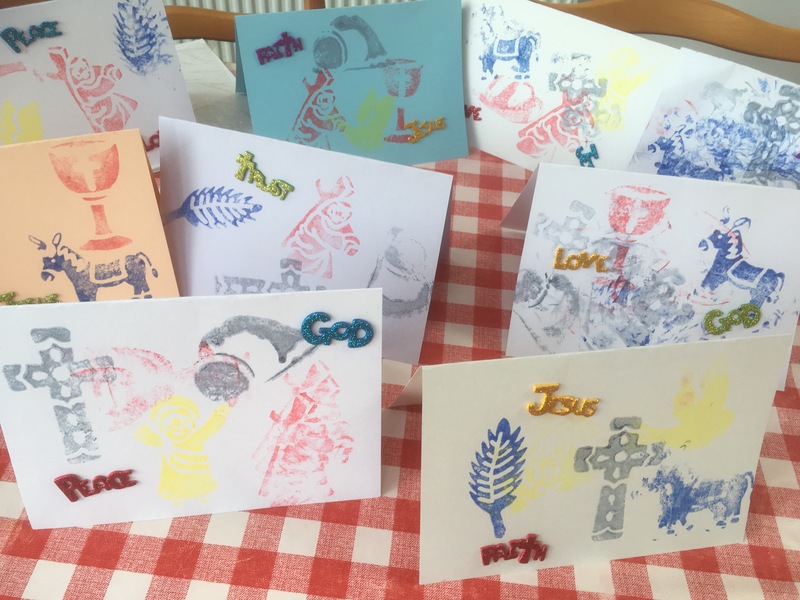 I printed the pictures on card and then covered them in sticky-back-plastic. I set up the scenes and went through the story with Bobcat and he enjoyed using them to retell it again and again. 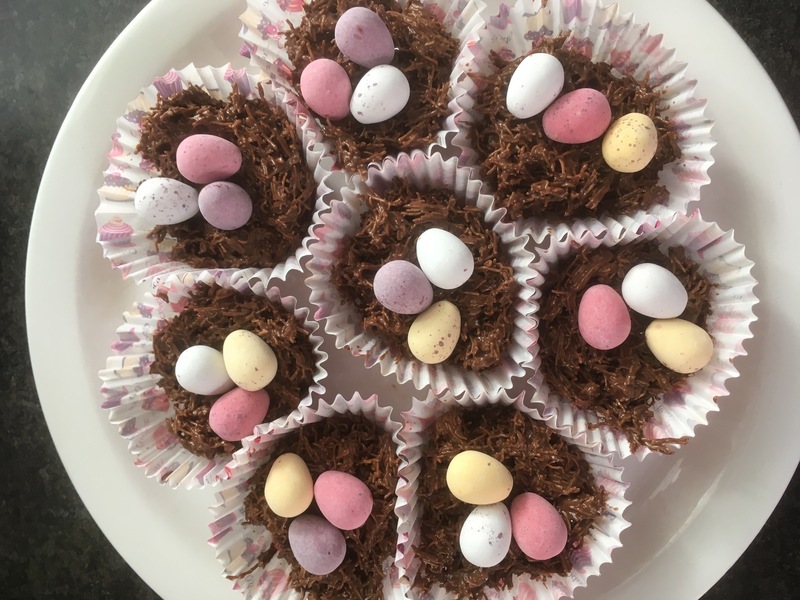 We made the obligatory shredded wheat easter nests – yum! 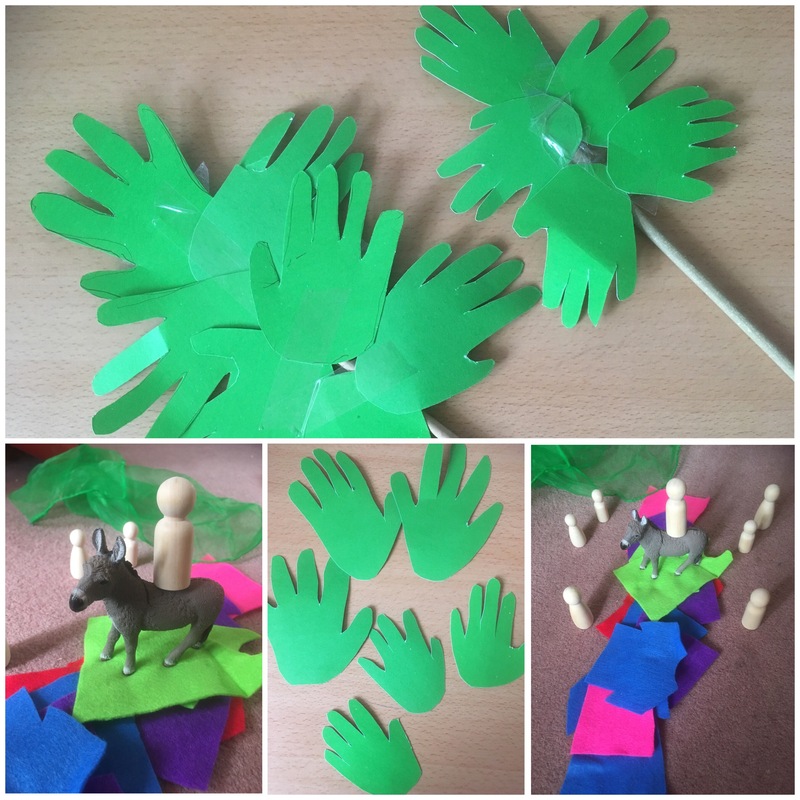 We celebrated Palm Sunday by making hand leaf palm branches to wave and playing Play Eat Grows coat game. We also recreated the story with a donkey, some felt clothes and peg people. 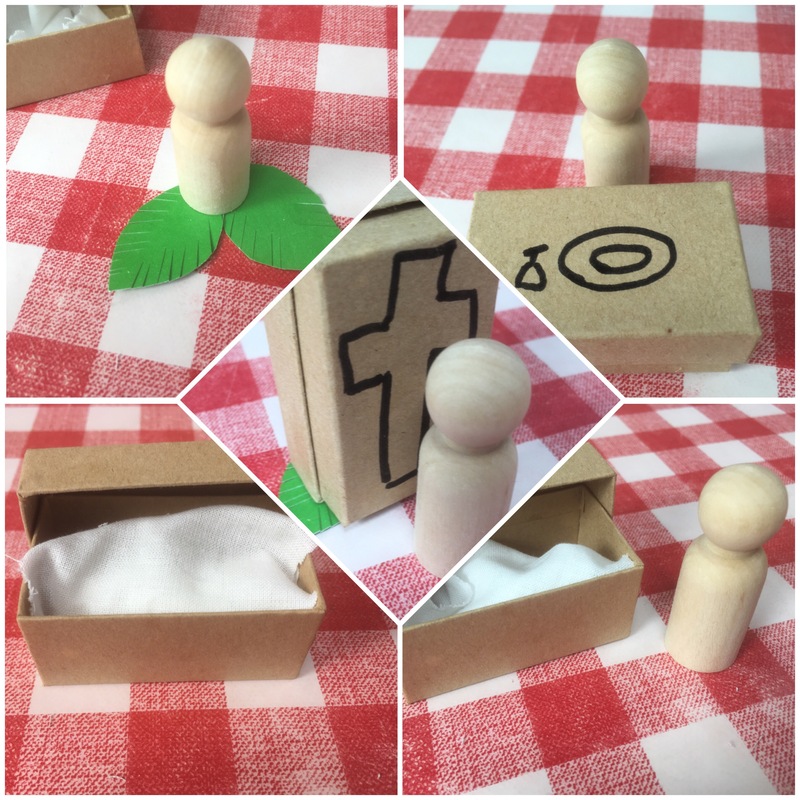 And we made some candle jars with our friends to use at our Passover meal. I use Baked Bree’s recipe to make matzo bread. 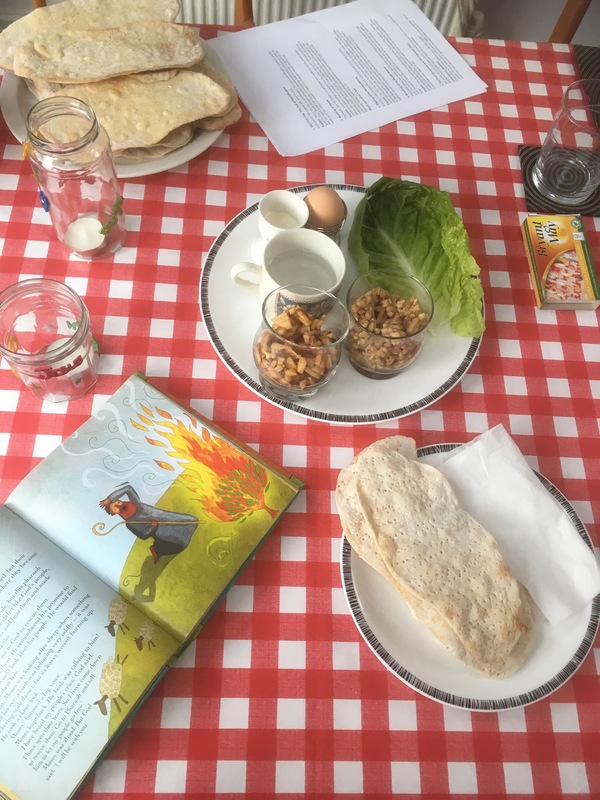 On Easter Sunday we also made resurrection rolls using the recipe from The Happy Tulip. 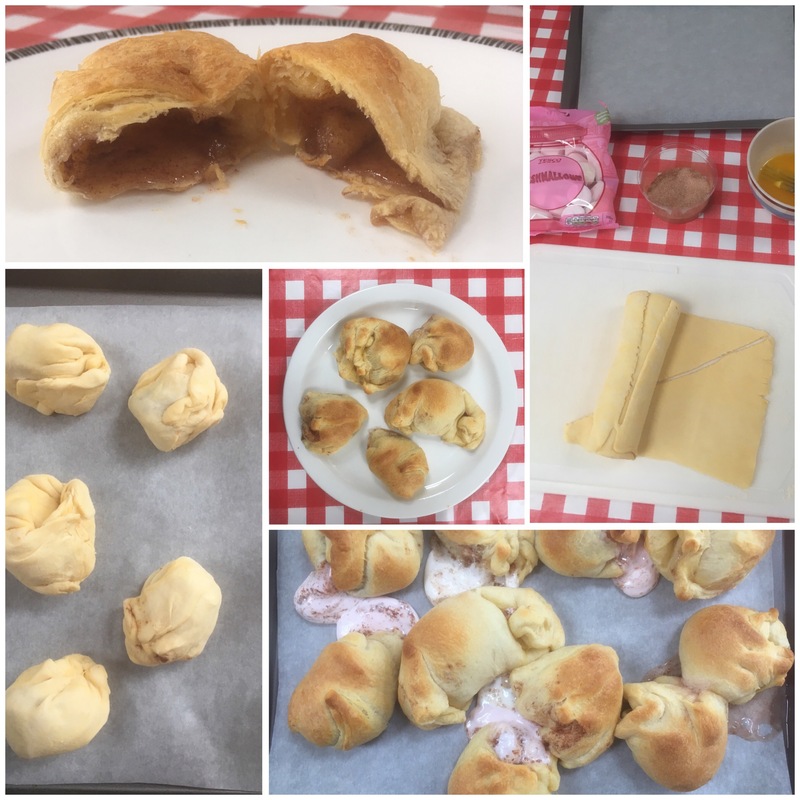 These are yummy and, although some of them still leaked, they turned out much better with crossaint dough than when I tried to use filo pastry last year! 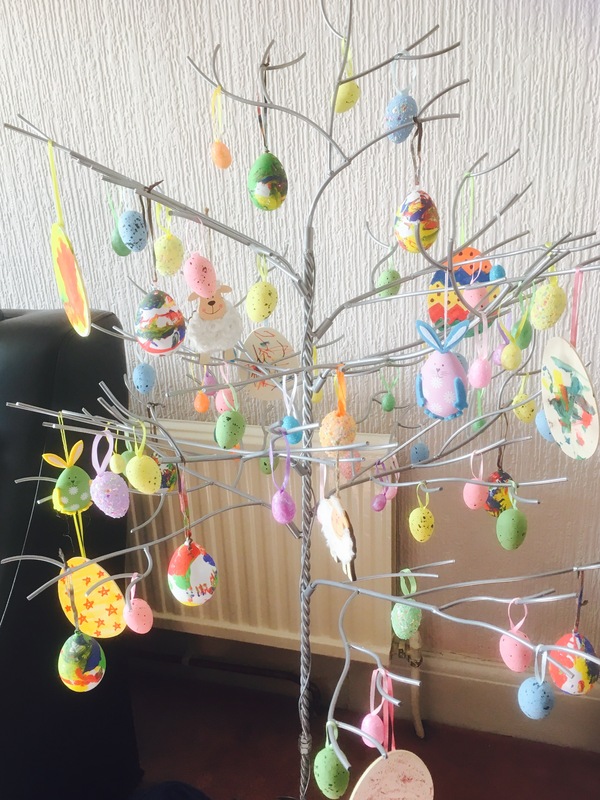 And on Easter morning Bobcat and Little Monkey came downstairs to find that their almost empty lent tree had turned into a beautiful colourful Easter Tree, complete with chocolate eggs and a new book. 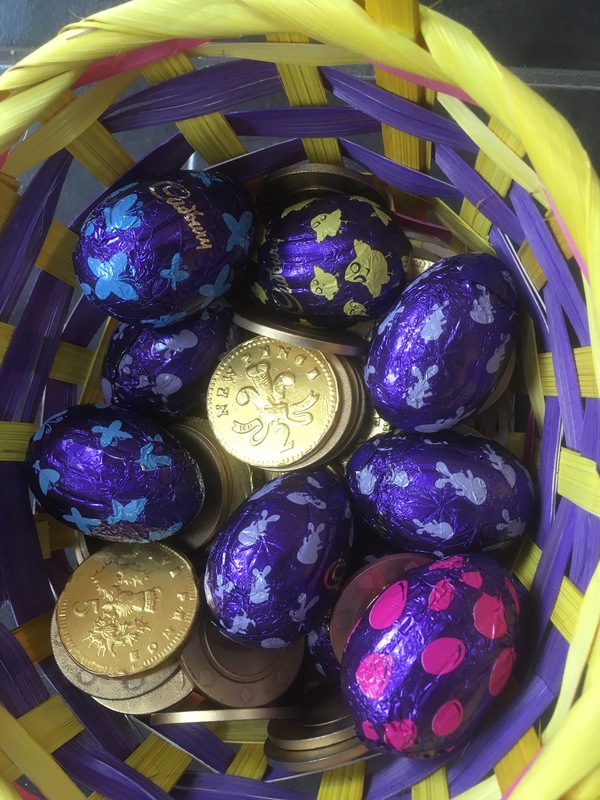 And of course we have had many an Easter egg hunt. 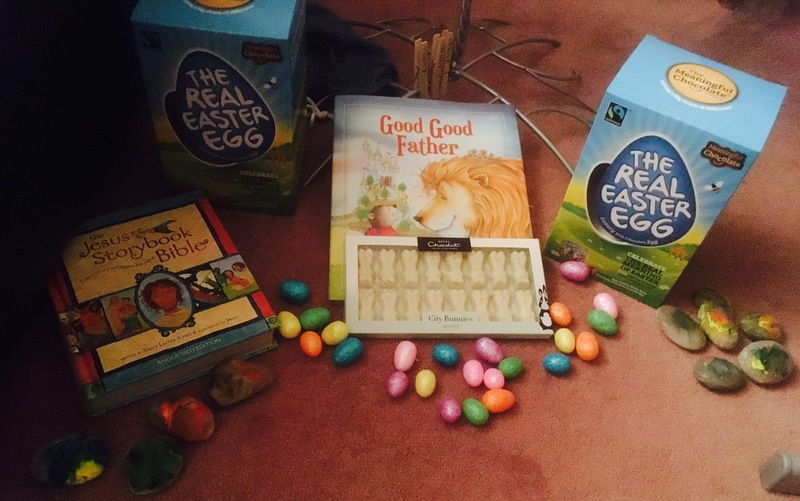 (On Easter Monday we found Little Monkey happily eating her way through a left over egg she had found!) 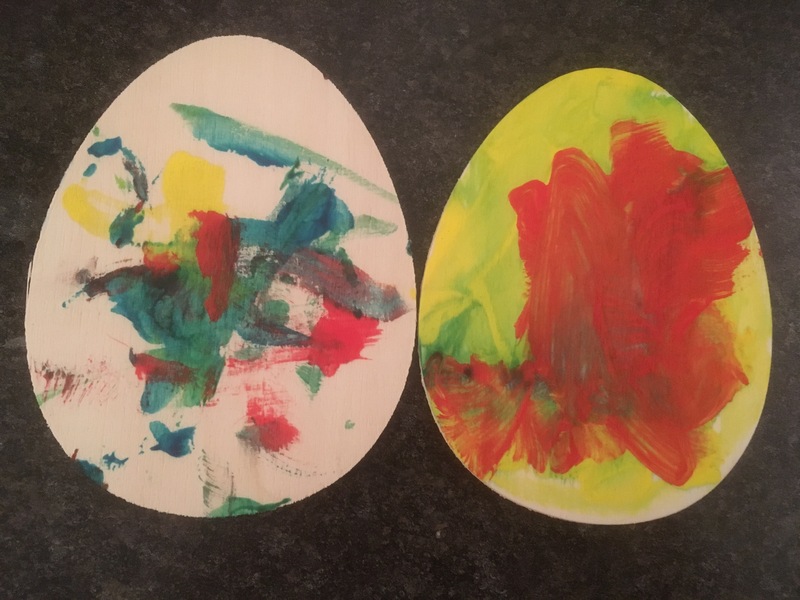 We only eat one egg each when we play so we can play over and over again all through easter time until all the eggs run out.